Sometimes a job comes along that's a bit of a challenge, but turns out beautifully and stretches a few neurons as it develops! 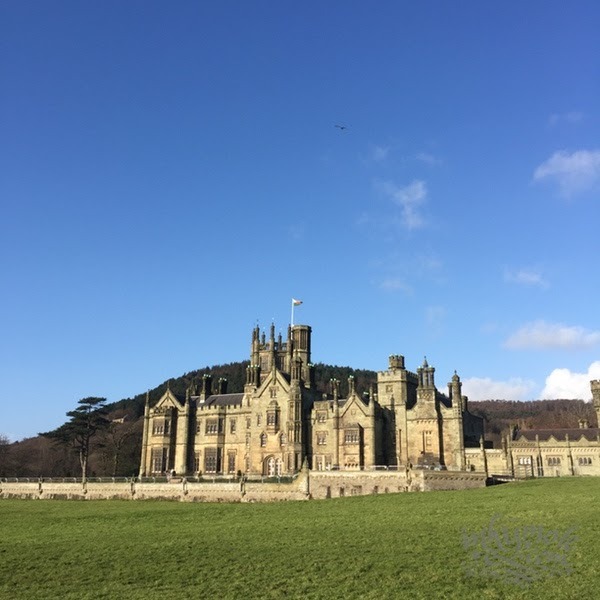 I was asked by Alison Lloyd, duty officer at the beautiful Margam Park, in Port Talbot, Wales, to create a metal tree for the castle on which visitors could hang their wishes. 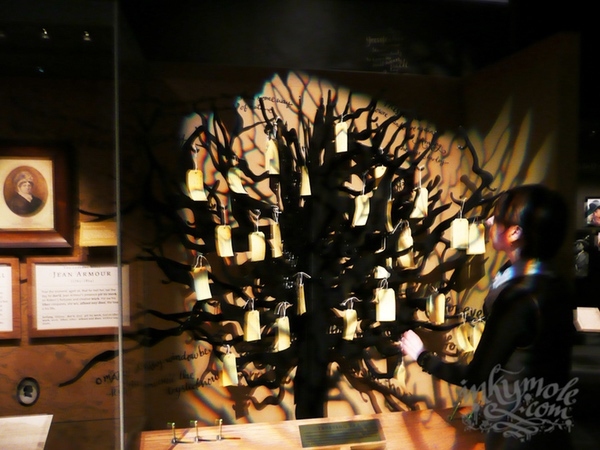 Written on little tags, each visitor would be invited to add their wish to the tree's limbs before leaving. 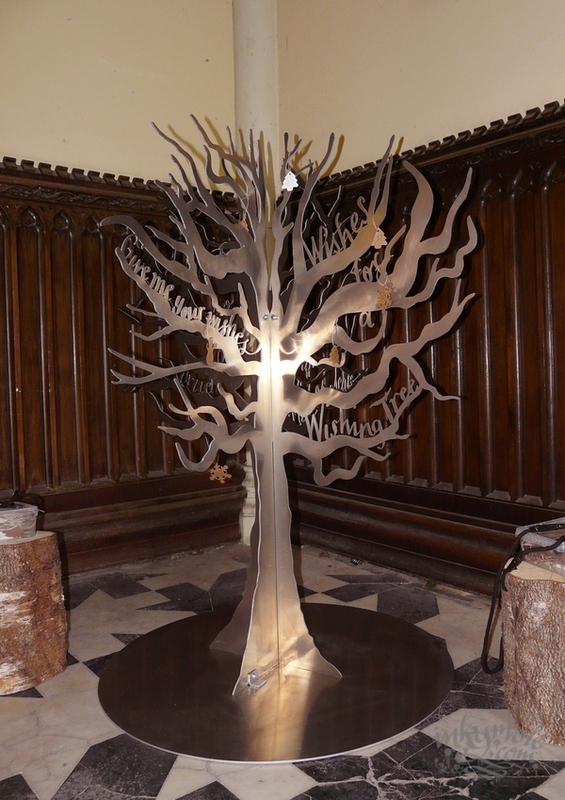 Having seen the Trysting Tree I designed for the Robert Burns Birthplace Museum in Alloway, Scotland, Alison's colleague Judith asked whether something similar, but larger, could be created for their castle. 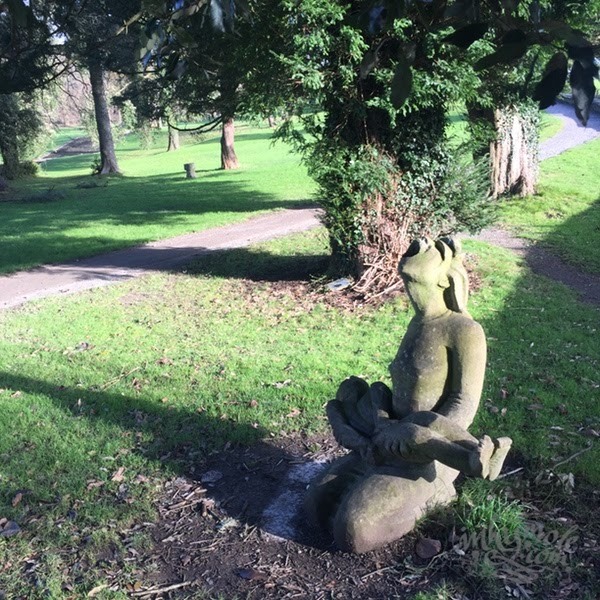 I had only designed the Robert Burns tree - quite a small one, at about three feet high - but hadn't had anything to do with its production. So this was to be a bit of a learning curve. 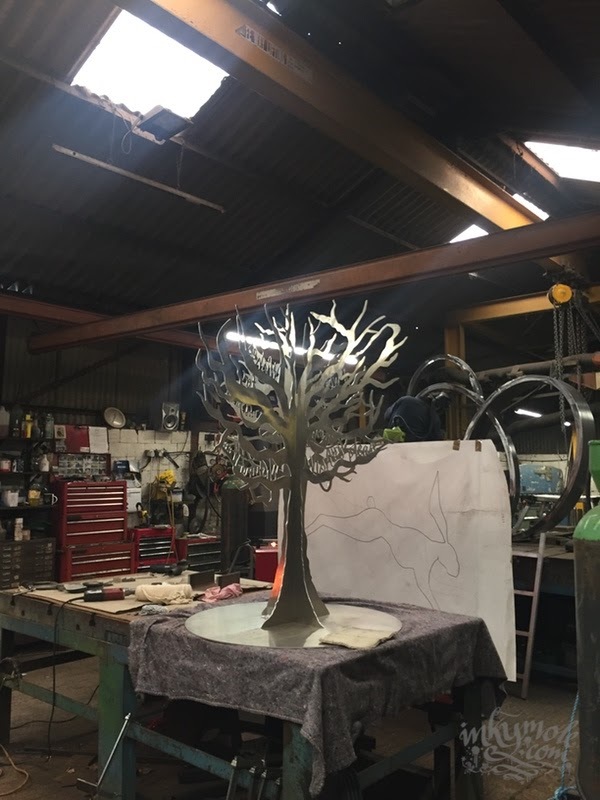 The brief was quite tricky - the tree needed to be made of metal, needed to come apart and be packed away for events throughout the year, and be used indoors and outdoors. It therefore needed to be very sturdy, but light enough for two people to assemble and dissassemble without damaging themselves or the tree! 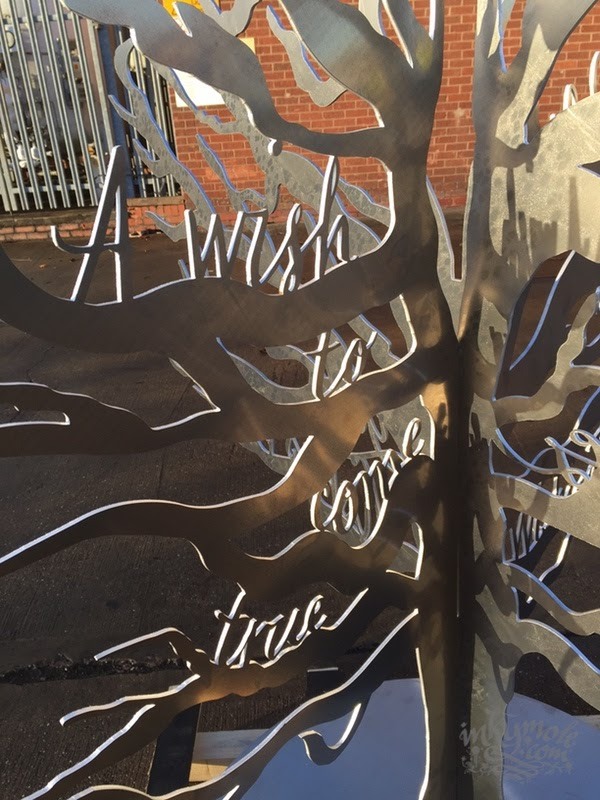 The tree at Robert Burns was laser cut and powder coated, so I decided on the same route. 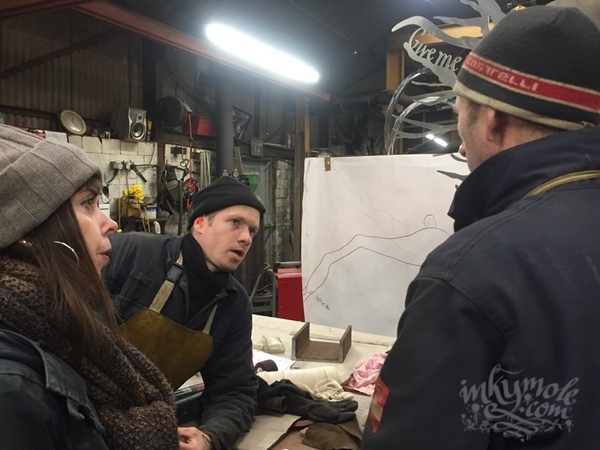 The Inkymolers in the fortunate position of being friends with the incredibly skilled quartet at metal art fabricators ArtFabs - Andy, Cass, Ant and Rob in Warwickshire, who do things with metal that don't seem possible. 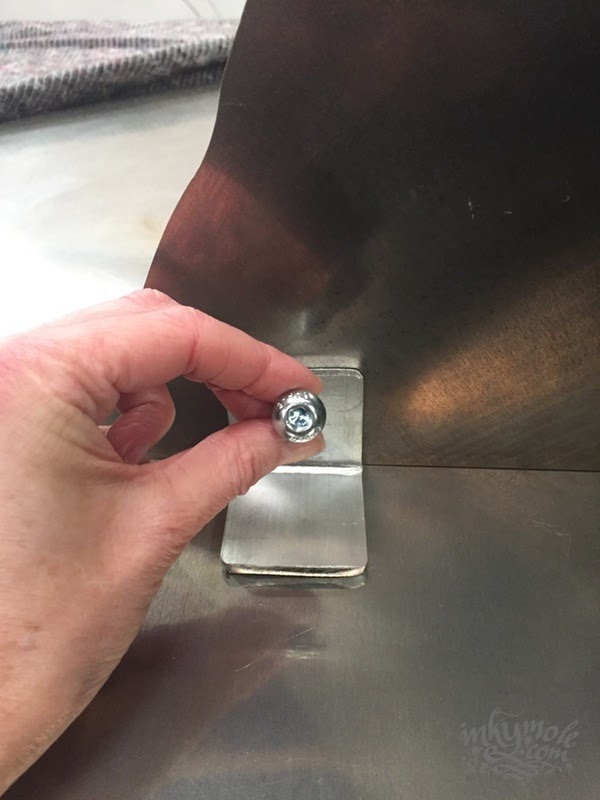 Seeing them work with metal is like watching someone fold and cut paper, bending and shaping it into beautiful shapes to artists' maquettes or designing solutions from scratch. They'd just finished building and installing the huge Liver Bird Meccano sculpture in Liverpool, an eye-watering feat of engineering and artistic interpretation, so I knew the first call I needed to make was to Andy, the owner. Needing to be large enough to have impact but low enough for children to reach the branches, I decided on a 5ft tree in 2 parts, slotting together like an old-fashioned wooden Christmas tree. 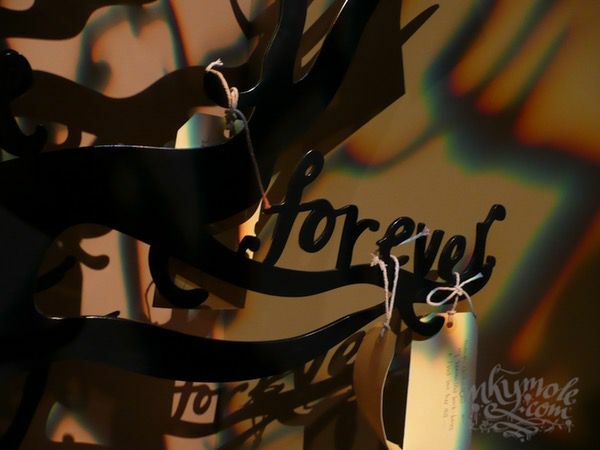 I drew the tree in ink with a brush, adding the hand-written 'Wishing' lines with a Nikko-G Japanese nib (which allows for both flat, wide strokes and fine lines) so that they made contact with each branch - laser-cutting requires a close eye be kept on any accidental free-floating elements, and joins need to be monitored for laser-ability. 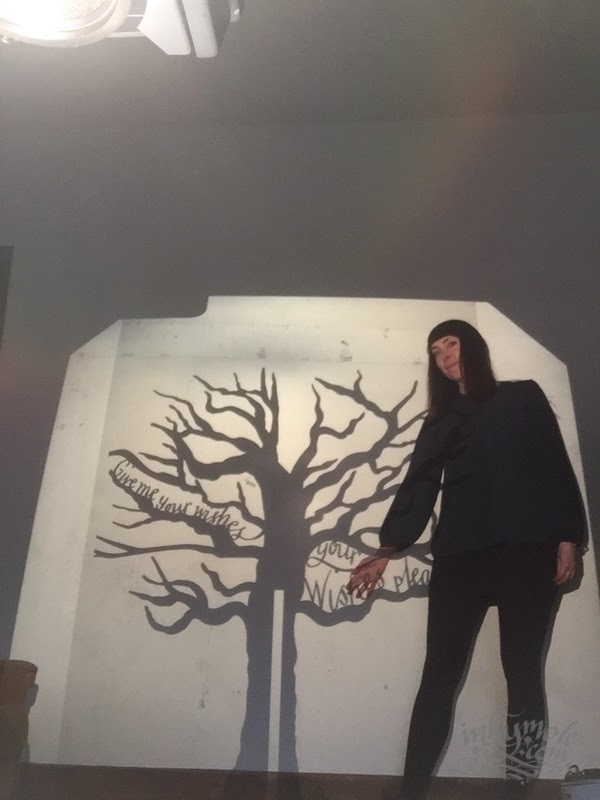 The technical challenge was how to make one part of the tree slot into the other without movement, but also without scratching its opposing part, so I made a series of life-size projections on the studio wall, alongside endless bits of sliced 5mm foam board to get the slot width just right. Additionally, a 1m base was recommended by Andy for extra stability, so slots were incorporated into the base for the four 'legs'. With the input of local laser cutting firm Subcon, who we'd used before for making modified parts for our cars, we decided on 6mm aluminium, with a powder coated finish. This would be light but strong, and the coating would protect the metal from finger marks. 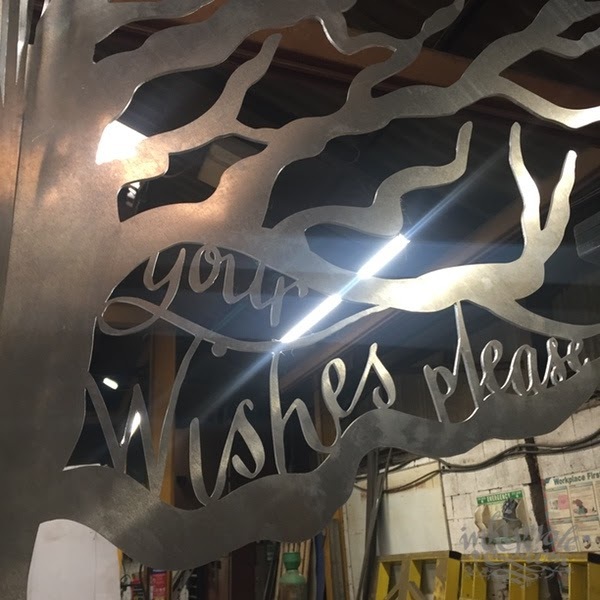 The design was scanned, brought into Illustrator and refined just to the point where it was suitable for a laser cutting machine, without sacrificing the organic, and-drawn look of it. It's too easy to get carried away moving points and fiddling with bézier curved in Ai, and over-smoothing was the last thing this tree needed; while fingers needed to be safe from sharp bits, this wasn't going to have the plasticised look of a lazy vectorisation! I exported to a .dxf file and handed it over to Jaz at Subcon, who checked it pre-flight for cutting, correcting the odd join and wayward spike here and there, and away it went. Meanwhile white was chosen for the powder coating, and we waited anxiously for the metal to come back. 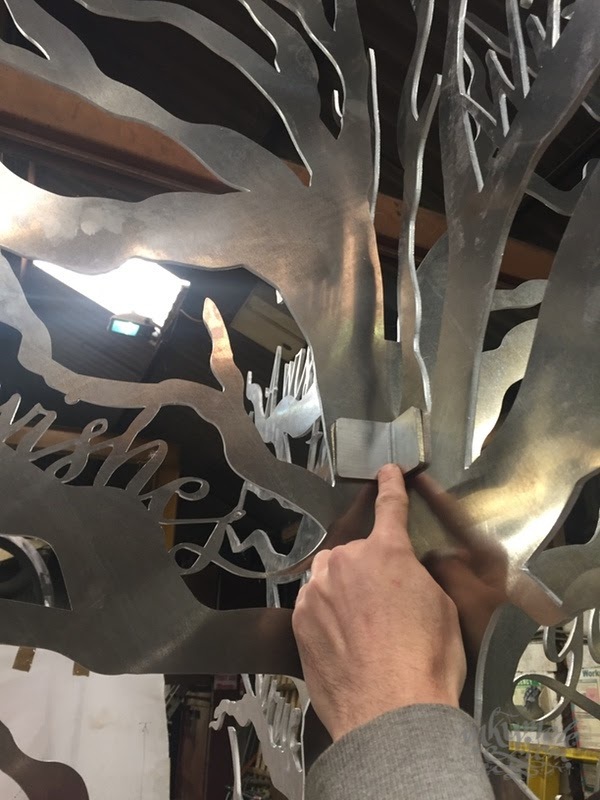 Fortunately, the client did too, and having let the powder coaters down gently, the tree went back to ArtFabs where Cass buffed, smoothed off any burrs, and hand-built the tiny bespoke brackets and bolts to hold the two-part tree to firm on it's 1m round base. 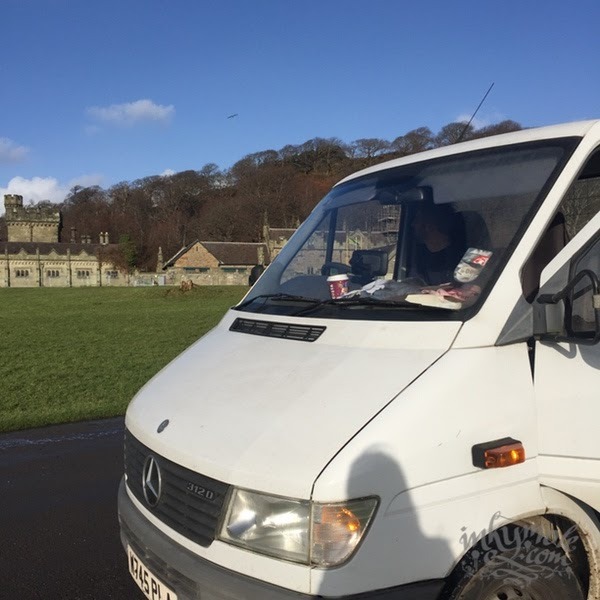 A 10 hour round trip to Margam Park in a truck saw the tree installed in the breathtaking entrance to the Castle, where a real robin greeted us by bouncing around among the park-sourced foliage festooning the gargantuan stairs. Christmas lights twinkled in the chilly air as the tree was erected and took its first 'wishes', where it will continue to live throughout the Christmas and new year holiday. I didn't think to add my own wish, but I might post one up for them to add on our behalf! 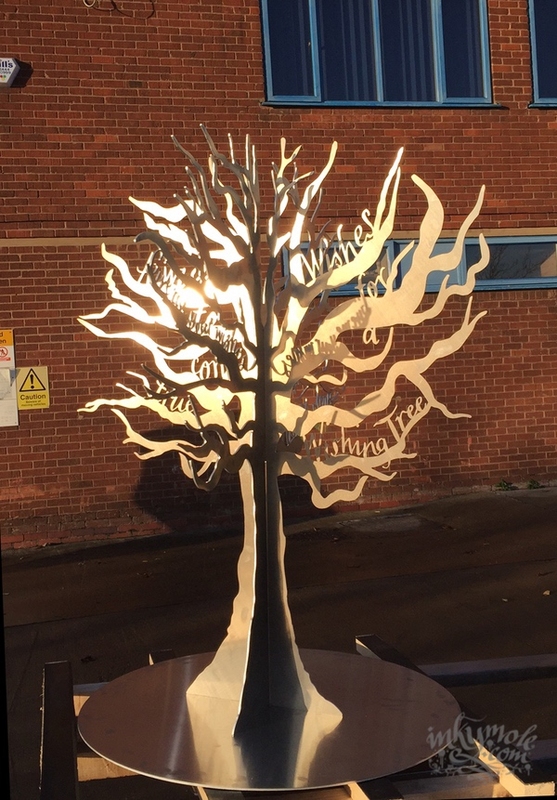 I want to thank Andy and his team, Matt and Jaz at Subcon for their advice and enthusiasm, Leigh for driving the tree to its destination and finally Alison and Judith for inviting me to make the tree. The challenging jobs usually turn out to be the best ones, and I think everyone is delighted with the outcome - I know I am! I'm looking for excuses now to build something else in metal; I'm itching to do it again. But maybe bigger...or more complex...or a different metal...or several metals...or...well we need a new Christmas tree, so maybe start there? 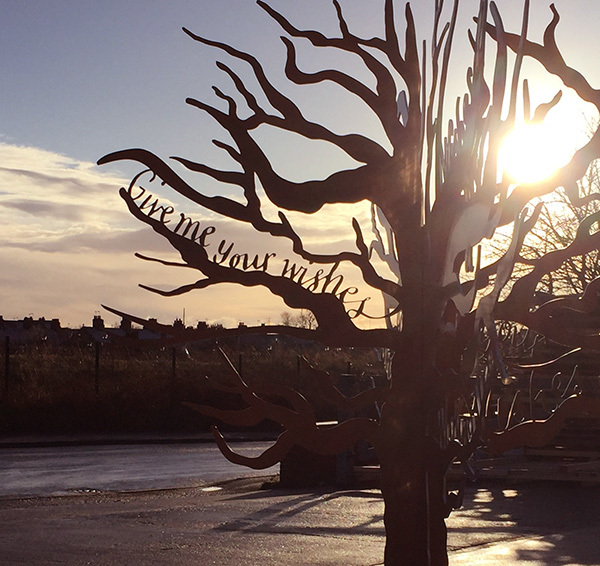 Thanks to Sarah and the Team for producing such a wonderful tree for us. 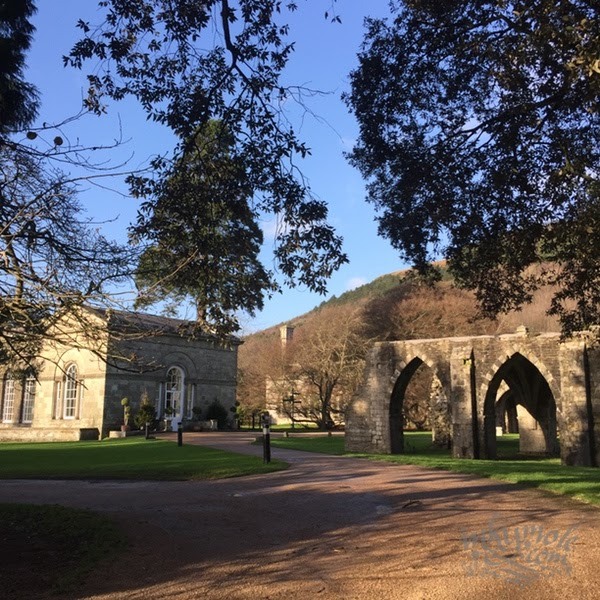 We are looking forward to using it in the future for all different events and celebrations! Thanks again and a very Merry Christmas to you!